← Bigfoot and the Bigfoot Hoax – why so much interest? 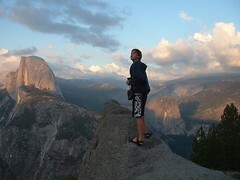 I was reviewing Yosemite pictures from five years ago and this one really stood out of my son Ben at Glacier Point, with Half Dome in the background. We camped a week at Yosemite with friends and it was a really great trip. I hiked Half Dome, something I’d wanted to do since I had moved to California in the 1980s. It’s been five years so we are definitely due for a trip back to Yosemite.